The knee is a complex joint, which is made up of the distal end of the femur (the femoral condyles) and the proximal end of the tibia (the tibial plateau). 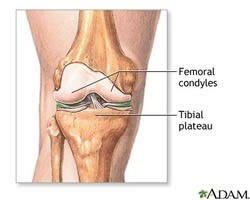 The femoral condyles usually glide smoothly on the tibial plateau, allowing for smooth, painless motion of the lower leg. The operation is performed under general anesthesia. The orthopedic surgeon makes a cut over the affected knee. The patella (knee cap) is moved out of the way and the ends of the femur (thigh bone) and tibia (shin bone) are cut to fit the prosthesis. Similarly, the undersurface of the knee cap is cut to allow for placement of an artificial component. The two parts of the prosthesis are implanted onto the ends of the thigh bone (femur), the shin bone (tibia) and the undersurface of the knee cap (patella) using a special bone cement. The surgeon will decide which type of implant and implant material – metal, plastic or ceramic – will work best for the patient. In many cases, a mini-incision can now be used to avoid cutting the tendon on the front of the knee. This allows for faster, less painful recovery than standard total knee replacement. Patients will return from surgery with a large dressing on the knee area. A small drainage tube may be placed during surgery to help drain excess fluids from the joint area. Patients experience moderate pain after surgery. However, they may receive injections of narcotic medications, patient-controlled analgesia (PCA) or epidural pain medications to control pain for the first couple of days after surgery. The pain should gradually decrease, and by the first day after surgery, pills may be sufficient to control the pain. It is important to control the pain enough to participate in physical therapy. Patients also return from surgery with several IV (intravenous) lines in place to provide fluid and nutrition. The IV remains in place until they are able to drink adequate amounts of fluids. Antibiotics are given to reduce the risk of developing an infection, which would require removal of the artificial joint. Patients also return from surgery wearing AVI foot pumps. These devices are used to reduce the risk of developing blood clots, which are more common after leg surgery. Patients should start moving and walking early after surgery. On the first day after surgery, patients may begin therapy as directed by their physician. When in bed, patients should bend and straighten their ankles frequently to prevent development of blood clots. Patients will be instructed on how to use an incentive spirometry device (a plastic device to encourage deep breathing) and cough and deep breathing exercises to gradually increase the depth of breaths in order to prevent lung collapse and pneumonia. A foley catheter may be inserted during surgery to monitor the function of the kidneys and hydration level. This is typically removed on the first day after surgery. Patients are encouraged to try to walk to the bathroom with assistance. With today’s modern, less invasive surgical techniques, the goal of joint replacement is to speed recovery and help patients return to their normal, productive lives as soon as possible. Patients should talk to their surgeon about what kind of recovery they can anticipate. Permitted activities and rate of recovery depend on the type of condition the patient had prior to surgery and the surgical method that was performed. Patients can typically go home the same day, but the total recovery period varies from a few months to a year. Walking and range-of-motion exercises will be started immediately after surgery. Some patients require a short stay in a rehabilitation hospital to become safely independent in their activities of daily living. It may be necessary to use crutches or a walker for a few weeks or even months after surgery. The physical therapy started in the hospital will continue after the patient has gone home until their strength and motion return. Contact sports should generally be avoided, but low impact activities, such as swimming and golf, are usually possible after full recovery from surgery. 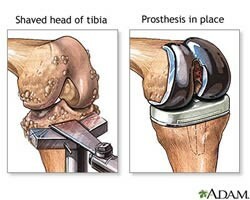 The results of a total knee replacement are often excellent. The operation typically relieves pain in over 90 percent of patients, and most need no assistance walking after recovery. Implants need to be checked with an X-ray every two to three years to establish normal wear patterns. Modern implants are designed to be repaired. Repairing the implant is a much less serious surgery than complete revision to a new prosthesis but must be done before there is any damage to the bone or possible loosening of the fixation of the implant.